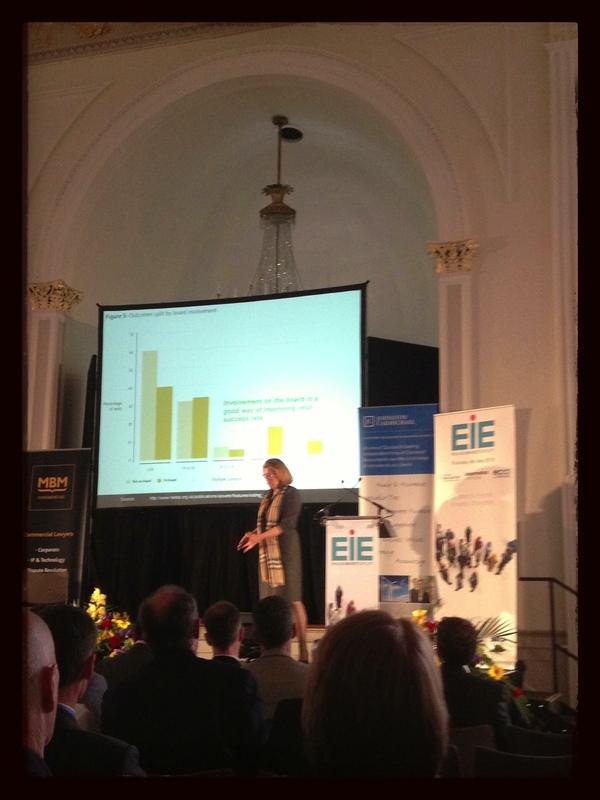 Today the annual Engage Invest Exploit conference took place in Edinburgh. Described as “Scotland’s premier annual investor event, showcasing the best companies spinning out of Scotland’s world class universities and start-ups from our wider entrepreneurial eco-system”, the event was significantly larger than previous years. There were two keynote talks during the event – Sir Tom Hunter (Scotland’s first home-grown billionaire businessman – see post here) and noted entrepreneur and business angel Sherry Coutu CBE. I wrote a liveblog during the event on the MBM Commercial Startup Blog. I’ve reproduced the notes here as there were some valuable points made by both speakers – apologies for the length but I’ve not spent any time tidying this up yet. Sherry Coutu started by saying that she can clearly identify a buzz around Edinburgh. It’s a city that she used to visit frequently a few years ago and she believes that, for the most part, from her viewpoint in Cambridge, we do have it ‘right’ up here. A brief history: Sherry came to the UK to study at the LSE before moving into work as a computer programmer. Crucially, she then attended Harvard Business School where she met around 850 entrepreneurs and studied entrepreneurship in depth. Surrounded by this level of inspiration gave her the confidence to jump into starting up her own venture. Her advice for those at the start of an entrepreneurial journey is to make sure that you meet as many entrepreneurs as possible. When you do, you start to realise that all entrepreneurs are the same type of people – focused on solving problems. Based currently in Cambridge, Sherry is involved in a large number of businesses and organisations (both for-profit and not-for-profit) as advisor or angel investor, including some well-known names such as LinkedIn, Raspberry Pi(the fastest growing company to ever come out of Cambridge), the Francis Crick Institute,Tyze, Founders4Schools and Silicon Valley Comes To The UK. It’s crucial in her view that we collectively encourage people to pursue entrepreneurship at an early age: particularly because the evidence shows that three times the percentage of children made different subject (and career) choices when they were exposed to quality role models – not the only overlap with Sir Tom Hunter’s keynote speech this morning. Sherry has made a total of 45 investments over the years at a rate of three or four a year (in order to insulate her risk and benefit from the crucial portfolio approach). She makes the point that being a business angel is more compatible as a career choice for a mother than being a full-time technology CEO. Impressively, the aggregated turnover of all of the companies with which she is involved was over $1 billion last year. Sherry’s focus in her keynote today is to run through nine key lessons from‘Startups That Scale – Why It Matters And How To Do It: Lessons From Silicon Valley Comes To The UK 2012’ [DC Note: the report is well-worth reading if you haven’t already]. We often focus on the failure rate for startups. However, it’s crucially important to understand how businesses actually scale up when they’re successful – because it’s only at that point that they create the all-important significant gains in employment, wealth, tax revenue etc. 40 years old: the average age of the founders of the 500 fastest-growing companies in the US (ref: Kauffman Foundation) – debunking the prevalent media myth that entrepreneurship is the sole preserve of the young. 40%: the average US GDP that is produced by companies that did not exist 30 years ago. 6% of SME’s produced 54% of all jobs in the UK over the last 7 years – or, to put it another way, 1.3 million jobs from a total of 2.4 million. Of course, you will hear people complain that technology is ‘bad’ because it threatens jobs. And it does – but mostly for those who remain in businesses that are unwilling to adapt and change. For everyone else, technology represents a significant employment opportunity. It is growing quickly – it was estimated that the UK’s internet economy accounted for 7.2% of UK GDP recently. The sector is growing faster than any of the UK’s construction, transportation or utilities industries and projected to grow to 15% by 2015. Think of what this means for what we should be teaching (to children) and funding (as investors). We have really big problems to solve in today’s world. You may understand a technology and view it as useful. But if it’s only ever going to be useful to another ten people in the world, you’re not going to be able to scale your business. Think hard: how many customers are there out there? Are they all easy to get to or are they all disparate and difficult to reach? It’s important to remember that a business that has insufficient potential customers in one country may in fact have the required number of customers when viewed on a global basis to ensure that the economics of the venture do start to stack up. Think of who your potential customers are, where similar people might be living around the world and consider whether you can structure your organisation effectively to service them. Basing yourself in an ecosystem that will support your aspirations is critical to build scale. For example, Cambridge is a cluster and Raspberry Pi wouldn’t have happened in any other place. This impacts on any decision that you make about where to base your subsidiaries also. Evidence that compares an individual with experience of growing a business on a larger scale than another shows that the skills and the productivity gap between the two individuals is huge (perhaps as large as a 20-fold improvement). So the lesson for entrepreneurs is that you must hire people who have done it before. Don’t just rely on your best friend who is keen and wants to learn. As an investor, of course, you should encourage those who are running your invest companies to hire such individuals. If you have an opportunity to grab a market share of £3 billion over the next three years, you really need to hire people who have achieved that level of success before. This is important in part simply because you will learn from working directly with them everyday about precisely how to do it. Sherry states that if she has a secret at all, it’s that she has always surrounded herself with such people. This is much more important than simply looking at the gender balance within an organisation. In order to understand a range of viewpoints, mix it up – get a social scientist into the same room as a data scientist, an accountant, whoever else and ask them to figure out problems. You will only restrict your potential if you simply get the same people together in a room to consider problems. In her experience, the most amazing innovations that she has seen have invariably come from people who just happen to be interested in a subject – for example, that’s why she is so excited about the progress and potential of current EdTech and MedTech ideas. As a founder, you must keep a strong sense on the company’s core values. For example, the recent statement by Marissa Mayer that she wanted to be involved in every single hiring decision at Yahoo raised a great amount of comment online. But Sherry entirely understands this position. If you hire someone who embodies the right attitude that you want (with a unswerving focus on delighting your customers), their intuition should (hopefully) not be too far away from yours in the future – and this should ultimately benefit your customer. Make sure you build your business in a way that makes it easy to scale. For example, Sherry discovered that one of her investee companies were using 23 different versions of their Terms and Conditions. The corporate infrastructure had therefore been built in a way that hampered the growth of the company. Focus on simplicity in the business. As an entrepreneur, imagine that you’re suddenly ten times your current size. This will help you to ensure you can scale fast when you do (hopefully) grow to that size. Entrepreneurs work hard because they believe that they’re making something that will make someone’s life better. Clearly, it’s essential any business to have a customer in the first place. But it’s also critical to make sure – repeatedly – that the ‘something’ fits what the customer actually wants. Sherry spoke about the importance of doing A/B testing and how one business in particular releases updated code ten times a day. Immediately following each update, the businesses records all of the behavioural responses. Now compare the level of insight and learning that you get (from ten separate learning ‘experiences’ a day) to another business that perhaps only releases new code once a week. That is a huge, cumulative difference in the speed of development based on real customer feedback. This is the route towards delighting your customers. Ultimately, your business must focus at all times on one question – how do you blow your customer away and make them love your product? Don’t ever rest in this continual testing process or stop thinking about what would be great for the customer and truly delight them. Everything you do must always be for the customer – if they don’t buy it, you have no business. It’s critical to ensure that you measure how much value is added by every incremental change in the eyes of the customer – focus intensely on learning from them everyday. Whatever you do, do not get stuck in the old-fashioned model of “it’s not perfect yet so we can’t launch”. Nonsense: if a customer gets angry with you, that’s a great sign because it is a signal to show you that something needs to be improved. The incumbent big business that you are competing against as a nimble startup can’t move and improve as quickly as you can so take advantage of this ability. The sources of available finance are varied – business angels, VC’s, incubators, escalators, venture partners etc. It can be very confusing initially as an entrepreneur so make sure you understand the differences and the pro’s and con’s of each option. Ultimately, if you’re solving a big enough problem well, you’ll find that there are a queue of people who are wanting to give you money. A useful mentality to adopt, therefore, is to think about what the potential investor can do for you if you choose to let them have the opportunity to invest in your business. Another obvious point but worth making – ensure your potential investor has enough money to follow his/her/its investment in a future round as you scale up the business. It may be a matter of fact that they have no cash to follow-on in the future but an investor who doesn’t invest more money in your business even if it is successful is unwittingly sending out a warning signal to other potential sources of money that all might not be quite as healthy in your business as it appears at first glance. Sherry rounded off her talk off with a summary of exactly why she gets so much enjoyment out of angel investing, whilst highlighting some of the important research that we’ve mentioned a number of times previously on this blog. * The average return from business angel investments is 22% (IRR) – significantly higher than for shares, gilts etc. * The average business angel has founded 2.5 ventures. * The average business angel is 53 years of age, has worked 14 years with a large company and 93% are male. The split of male and female business angels in particular remains surprising to Sherry given how compatible she finds the activity with her role as a mother in a family. [DC note: the UK Business Angels Association continue to actively campaign to improve this gender disparity]. Sometimes an entrepreneur will talk about how they got money after only a 15-minute chat with a business angel. However, the evidence clearly shows that the more time that a business angel spends asking questions before investing has a significant positive effect on his or her returns. Doing proper due diligence significantly improves an investor’s chances of success so don’t be offended by the number of questions that he or she has for you. In Sherry’s experience, being on the receiving end of such questions during funding rounds has actually provided her with a great deal of insight into her businesses. As an investor, the evidence shows that you should invest in things that you understand. Sherry learned this the hard way in the early days as an investor by investing in areas that she was interested in and simply wanted to learn more about (as opposed to knowledgeable about). Another takeaway for the investors in the room: the success of investments for business angels increases significantly if the investor takes a seat on the board post-investment. Of course, the statistics on this point may look very different in the near future when the more recent effects of the growth in crowdfunding are factored in. From an entrepreneur’s point of view, however, the involvement of business angels on the board is significant as well in terms of experience and helping the founder to avoid certain potholes. Sherry rounded off by comparing the high-growth technology scene in Cambridge to Edinburgh. Incredibly, in Cambridge there are some 1,525 technology companies that directly employ 50,980 people (in a place that only has a population of c.122,000). These companies have generated sales of £11.8 billion, with the top 50 companies hired 5,901 people in 2011 (a 23.2% increase), growing their revenues by £1.3 billion (a 17.6% increase). If you are in any doubt about the power of successful technology businesses to create success, these figures should convince you otherwise. The final message is ultimately one that chimes with Sir Tom Hunter’s message from the same platform this morning: entrepreneurship is critical. We should focus on startups but we also need to think really hard about how to help the successful companies transition to the next level. In the UK, we have the same number of startups per capita as in the US, yet we only manage to scale up between 1/3 and 1/2 of the number that reach scale in the US. Just think of the results if we start to raise this figure – for the entrepreneurs, for the investors but most importantly, for the country as a whole. To finish with Sherry’s final words: if you’re an entrepreneur – please do it. We have some really big problems that we need to solve – and there’s no-one better placed to solve them than you.